Power metal is an often explored genre and has seen many faces and bands. It's now Cain's Offering's turn to take a stab at the genre. Although they aren't breaking any new ground here, Gather the Faithful is still a good album. Guitars are accurately symphonic, drums and bass make up a fine rhythm section and vocals are the typical affair. 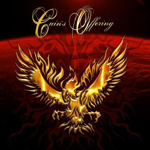 Power metal has grown used to this sound and Cain's offering does it well. Three songs in you've heard all the bands tricks however that's not to say the rest of the album isn't good. 'Thorn in My Side' sounds very similar to 'My Queen of Winter,' but works nonetheless. 'Morpheus in a Masquerade' is probably the best song on the album, combining all the things present of the album. After that, however, 'Stolen Waters' might just be going through the motions. While Cain's Offering is nothing new or special, you'll have a hard time convincing yourself any of it is bad. Playing it safe is sometimes a good thing but I just wish this band would have taken it a step further.